Note: This is #2 in a series. If you want to read the first Email for Sales post, it’s right here. Conferences are a mixed bag. No one needs another reason to get on a plane, stand in epic taxi lines, sleep in marginal hotels and eat more crappy food. On the other hand, the best conferences are an insanely valuable gathering place for your industry. Meeting at shows are often the only way to spend time with a real thought leader or decision-maker. And, very occasionally, the speaking sessions are great. So at the risk of sounding like a conference ho, salespeople should really go to all the meaningful conferences in their industry. But what is a “meaningful” conference? The only indicator of whether the trip will be worth the time and money is the meetings I have set up beforehand. My go/no go criteria is this – at least five decent meetings and one excellent meeting set up before I get on the plane. To hit this number, I start working it about three weeks before the conference. I’m looking over the speaker list and the exhibitor list for my prospects or big customers, and I’m emailing my contacts at those companies to see if they are going. Here are sample sales emails for setting up conference meetings ahead of time. Want one-click-copy email templates to start customizing right now? Grab 18 here. Subject: [speaker name] speaking at CES in January. Are you going? I’m thinking about going to CES, and I saw that [speaker name] is speaking on [talk title]. I heard her present at [some place you’ve heard her present], and she was pretty [insightful, smart, energetic, inspiring]. [If you haven’t heard her speak, say “It looks like a great talk.”] Are you going to be there too? If so, let’s meet up right after the talk. I’ll give you a quick update on how our [new product/feature/initiative] could help with [issue/opportunity] you are working on. As I mentioned in my first Email for Sales post, I’m really into specific details for these messages, so whenever I send something to a client or a prospect, I try to make the note as relevant and detailed as I can without sounding like one of those NLP salesguys who use your name every other sentence. If the prospect above writes back and says “Sorry, not making this one” you have a great opportunity to reply with “Ah, too bad. It would have been good to catch up. Can you do an email introduction with [speaker name]? I’d love to say hello after her talk, and I don’t want to be one of those guys lining up for her as she leaves.” This approach can be easily adapted for companies exhibiting at a show, having parties or events, etc. My go/no go criteria is this – at least five decent meetings and one excellent meeting set up before I get on the plane. Subject: Going to CES… Are you available on Wednesday at 11am? I’m braving the taxi lines again this year because my company is getting some strong interest in our [new product/feature/initiative]. I’m also excited to see your [speaker name // product launch // exhibit space] and catch up on what you’ve been doing. Are you available for a quick conversation on Wednesday at 11am? We can meet at your booth if that’s convenient. Again, I’m always specific about what I’m doing, what they’re doing and when we could meet. I don’t try to sugarcoat the fact that I want to tell this prospect about my product. But I am absolutely sure to be knowledgeable and curious about their reason to be at the show. Ideally, the first 30% of our meeting will be about them, their product and their opportunities. After I send that note, I block out the time in my calendar with a question mark after the person’s name, so I don’t promise the timeslot to someone else. I also block out talks I have to give or want to attend, and booth responsibilities, if I have any. Ideally, the first 30% of our meeting will be about them, their product and their opportunities. Sidebar – I’ve done a lot of booth duty, and while it’s great training for cold calling and taking a fresh start, it’s not a great way to do business. What’s the best defense against getting slotted for booth duty by your marketing team? Set up a ton of meetings beforehand. Continue sending these emails right up until the day before the show. You should arrive at your hotel with almost every hour slotted. Being a speaker at a show brings all kinds of credibility-boosting branding opportunities. Don’t waste them, because speaking slots are exceptionally hard to come by when you have “sales” in your title. I’m speaking at Venturebeat’s DiscoveryBeat conference next Monday with EA’s Sebastien de Halleux. Subject: Speaking at DiscoveryBeat on Monday. Would love your feedback on my startup. 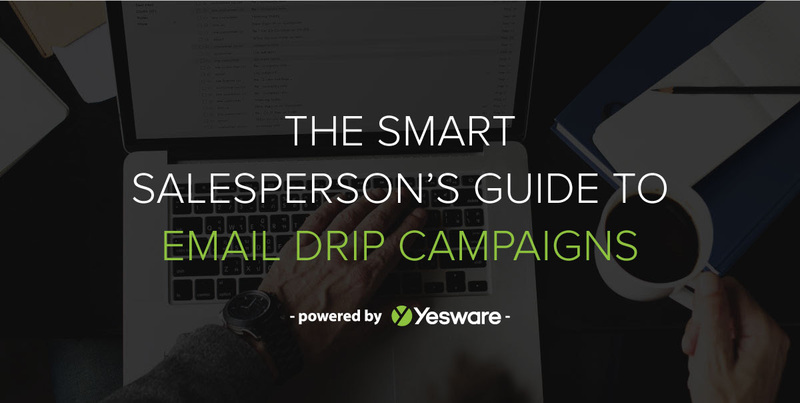 esware (www.yesware.com) and it’s right in your wheelhouse – we’re combining email, crm and special sauce to improve the professional lives of salespeople. You can see a short video about it on the website if you are curious. It would be incredibly helpful if I could give you a quick summary of the product and our initial marketing strategy, and then hear your feedback. Are you free next Monday at 2pm?